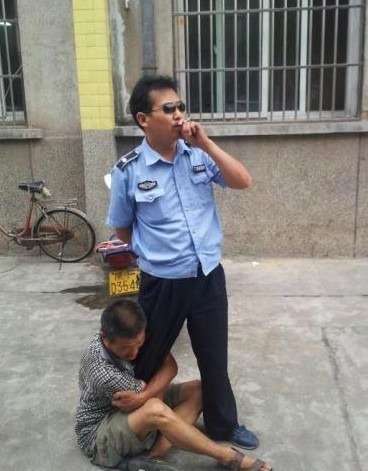 Yesterday, a photo of a street peddler clutching onto the thigh of a municipal inspector known as the Chengguan was widely distributed on the internet. In the photo, the Chengguan wore a pair of sunglass and was smoking. According to Lu Xueyuan, the street peddler in the photo, he was hugging the Chengguan because his scale was confiscated and he was beaten by municipal inspectors in his previous trading on the street. The Bureau of City Administration and Law Enforcement of Chenggu County, Shaanxi Province denied that they beat Lu Xueyuan, and claimed that Lu repeatedly violated regulations while street peddling, and often clutching onto the Chengguan’s thigh. 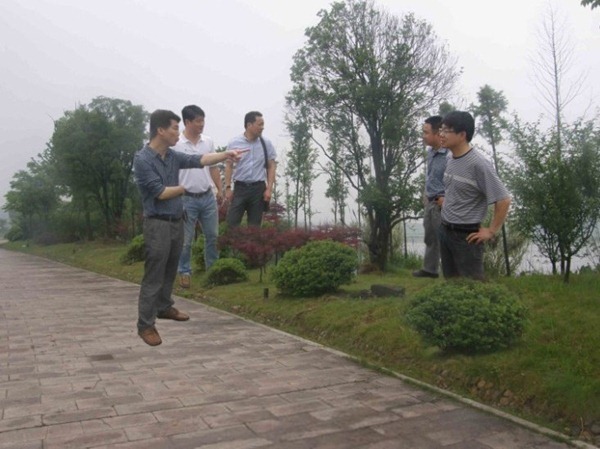 The photo was uploaded by Cui Yongli, a journalist from Huashang Daily. The photo showed a middle-aged man in a black-and-white checker shirt sitting on the ground, with his head down, and his hands holding tightly onto the thigh of a man in light blue uniform. The uniformed man was wearing a pair of sunglass, smoking and looking away. Cui Yongli wrote on his microblog, “I was conducting interviews in Chenggu County just now, and saw a man suddenly grab hold of a Chengguan. The man was a street peddler called Lu Xueyuan, whose scale was confiscated by city inspectors at the end of this May. He claimed that he was beaten by several Chengguans in their office when he asked for his electronic scale back. He called the police but did not get any result so he went to take hold of a city inspector. After mediating by the journalist, the two parties agreed to negotiate in the office.” Yesterday afternoon, Cui Yongli confirmed to Southern Metropolis Daily that he took the photo at around 10am yesterday when he passed by the Bureau of City Administration and Law Enforcement of Chenggu County. This microblog entry was widely forwarded. Yesterday, Lu Xueyuan told Southern Metropolis Daily that he was enquiring the status of the getting back his scale at the Bureau of the Municipal Administration when “I spotted the Chengguan who beat me the most fiercely walked in, so I went up to clutch his thigh to seek some explanation.” Lu said he held the thigh for more than 10 minutes and the Chengguan did not say a word. He let go of the Chengguan after Cui Yongli’s persuasion. Lu claimed that he did that because he was “locked into an office and beaten by 7 or 8 Chengguans”. Lu Xueyuan was a street peddler, selling fruit. He claimed that on May 30th, he argued with the patrolling Chengguans when they confiscated his scales. Two days later, when he asked for his scales at the Bureau of Municipal Administration, he “bit a team leader’s thigh” in a fight, and then he was beaten by “7 or 8 city inspectors” in the office. Last night, the Bureau of Municipal Administration of Chenggu County sent a statement to Southern Metropolis Daily, and claimed that the man smoking was the driver of the Urban Monitoring Unit, which was an affiliate of the Bureau. As for yesterday’s “thigh clutching incident”, the statement responded that in the morning of July 19th, Lu “yelled” at the Urban Monitoring Unit and clutched the driver’s thigh. He threatened that “if the Unit declined to give him RMB 10,000 as compensation, he would not leave”, and claimed that the Chengguans beat him. During this whole process, the driver “did not give any resistance”, and he wore sunglasses because it was a requirement of his job and smoked in order to “stay calm”. As for the photo distributed online, the statement said that yesterday “an unidentified person” kept taking photos and the Bureau suspected it was “a premeditated and planned action”. After the incident, the Bureau asked the driver to “stop his work and have self-reflection”, and ordered the City Monitoring Unit to handle the incident properly. Today, the Chengguan in Chenggu County, whose thigh was clutched, was suspended from his job. Meanwhile, the Bureau of Municipal Administration “suspected that this was a premeditated and planned action”. I did not expect the Bureau of Municipal Administration of Chenggu County would be as shameless as this, and hope it can provide evidence that this was “premeditated”. This afternoon, the Vice Director of the Bureau invited me to have dinner with his team leaders. I declined the invitation and could not imagine the result of going to such a dinner, which was clearly a trap. Shameless. That is not Rodney King is it? “Obviously we can’t tell people which city we can and can’t live in,” Kenney said. Chengguan: the red guard in blue shirts!